There are two types of people that visit the Algarve without a car: those that can’t drive and those that don’t want to drive. If you can’t drive, read this article to see how to get around (skip the next section). If you don’t want to drive, or you’re too nervous to drive in Portugal, maybe it’s worth reconsidering: getting around the Algarve without a car isn’t impossible, but it can be limiting – particularly if you want to visit more remote parts of the Algarve (e.g. some of the beaches or the West Coast). Of course, some people won’t need a car for their trip to the Algarve. If your plan is to head to your hotel, and if your hotel is within walking distance of a beach and some restaurants, and that’s really all you’re visiting the Algarve for, you probably won’t need a car. In fact, it’s probably easier just to take an airport transfer from Faro Airport to your accommodation and then to book a taxi or day trip if you decide to go somewhere. If, you plan to do a little exploring however, either visiting the beaches or nearby towns, you’ll probably need to consider where you stay and how easy it is to get to other places from there. Is driving in Portugal so bad? Driving in Portugal can be a little bad sometimes, it has to be said, but actually the Algarve is one of the easiest places to drive in Portugal. The toll roads are practically empty most of the time, and even the non-toll roads are fairly easy to drive along. Parking is also much easier here than it is in places like Lisbon and Porto: unless you’re in the heart of somewhere like Faro, you’ll rarely struggle to find a parking space or need to parallel park. If you’ve never driven a left-hand drive before (British and Irish visitors) or if you’ve never driven a manual car before (North Americans), the Algarve is actually quite a good place to learn. Still not convinced? Here’s how to get around the Algarve without a car. If you don’t have a car, and especially if you’re visiting the Algarve during the summer, you’ll probably want to stay somewhere that’s within walking distance of a beach. If you’re planning on exploring a lot, you may also want to consider staying somewhere that has a train station. It’s not essential (you can get everywhere by bus), but it does give you on extra way of getting around the Algarve. If you’re planning on exploring other towns on the Algarve, you’ll be able to do so by: train, bus, taxi, coach (day trips), renting a car, or by boat. The train is one of the easiest ways to get around the Algarve but, as you can see from the table above, not every town has a train station which means you’ll have to take a bus to visit some towns. It’s also worth noting that some towns have train stations, but the train stations can be several kilometres from the actual town. Don’t worry, though: most of those train stations will have taxis waiting outside that you can take to get to the nearest town. 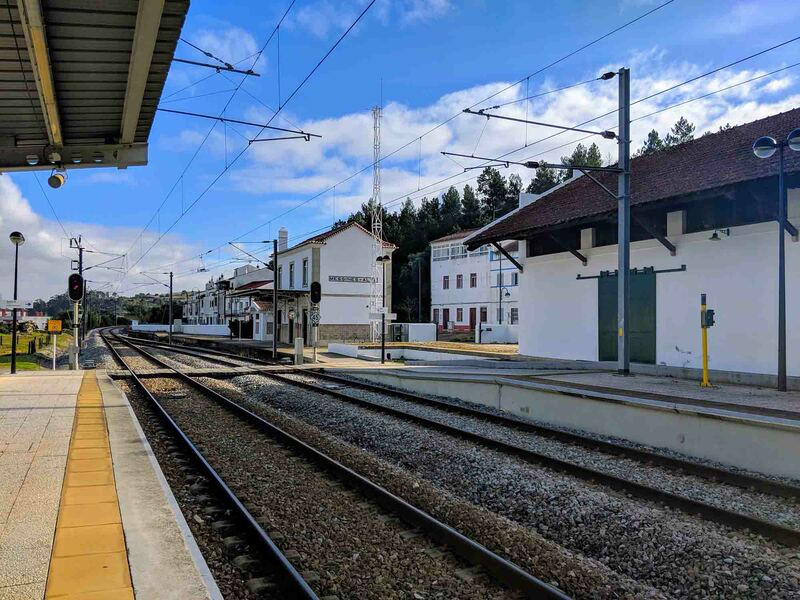 The main towns that have a train station are Lagos, Portimão, Faro, Olhão, Tavira, and Monte Gordo. You can check timetables and buy tickets at cp.pt. The Algarve has a good bus network that connects most of the towns and villages. The easiest thing to do is to decide where you want to stay, and then to see where you can get to by bus from there. The main bus company in the Algarve is Eva Bus. Frota Azul also covers some routes in and around Portimão. The Rota das Falésias minibus connects Ferragudo, Carvoeiro, and Lagoa with a number of beaches nearby (note: this bus only runs in summer). There’s a free bus between Albufeira and Algarve Shopping, a small shopping mall with a cinema near Guia (note: this bus only runs in summer). Most towns on the Algarve have a taxi rank, and some taxi apps like Uber also work here as well. Of all of these, Uber generally has the most cars and the shortest waiting time. Uber is most common in coastal towns like Albufeira, and you may have to wait longer if you’re somewhere more remote. If there aren’t any Ubers nearby, and you can’t find the nearest taxi rank, you can phone Taxi Arade on 00-351-282460610 (operators speak English). Most major coastal towns on the Algarve, like Albufeira, Praia da Rocha, and Carvoeiro, will offer day-trips by bus to nearby towns (especially Silves and Monchique), and you’ll see these tours advertised at local travel agencies in the town centres. You may not want to rent a car for your entire trip to the Algarve but, if you’re planning on visiting more remote parts of the Algarve, it could be worth hiring a car for a day or two. Most towns on the Algarve will have at least one car rental company, and you can easily see who is nearby using a website like rentalcars.com. You can actually get around parts of the Algarve by boat. Portimão to Silves: There’s a river boat ferry that takes you from Portimão to Silves by ferry, where you’ll then have some time to explore Silves before being taken back to Portimão again. Don’t worry if you’re not staying in Portimão as the boat company organises a free shuttlebus that’ll pick you up from your accommodation in Alvor, Portimão, and Praia da Rocha. (Buy tickets on AlgarveFun.com). Ferragudo to Portimão: There’s a “taxi ferry” that connects Ferragudo and Portimão and vice versa. Finding timetables can be quite difficult, but you can ask them via their Facebook page.